Soundstation Studio follows standard sequencing conventions. Soundation Studio is the latest release from PowerFX, and represents something of a departure from the company's sample-providing roots. 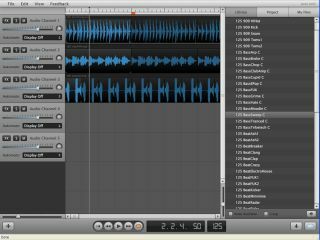 In fact, this is another addition to the rapidly-growing roster of web-based music creation apps. Looking very much like a standard DAW, Soundation Studio lets you use as many tracks as your computer and internet connection can handle (processing is done locally). The beta version includes upwards of 400 royalty-free loops in various styles, nine effects, track automation, basic loop editing, timestretching, master channel control, publish to web and download to desktop features. To try Soundation Studio, simply click here. It's ridiculously easy to use, but if you need some help, check out the tutorial videos on its dedicated blog.